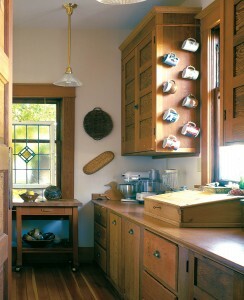 Small shelves frame the sink while heavy duty storage is on the back wall in a dresser. 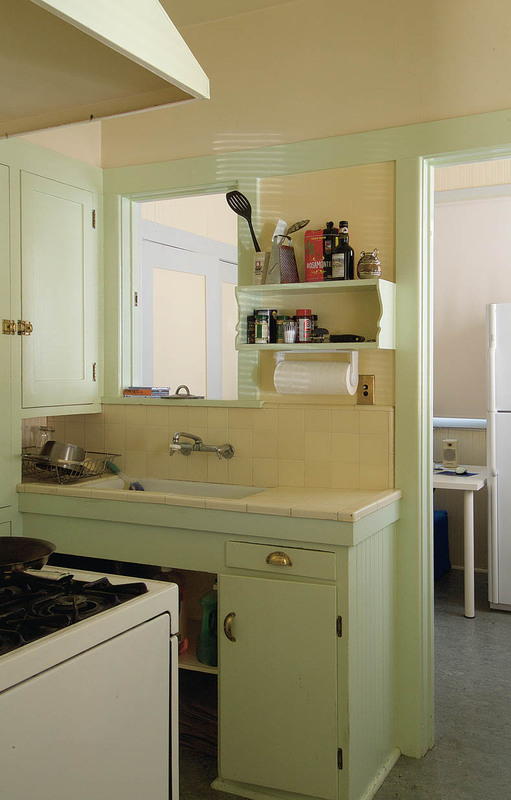 INTACT BUNGALOW KITCHENS ARE RARE GEMS…tiny, incredibly efficient, sparklingly clean. 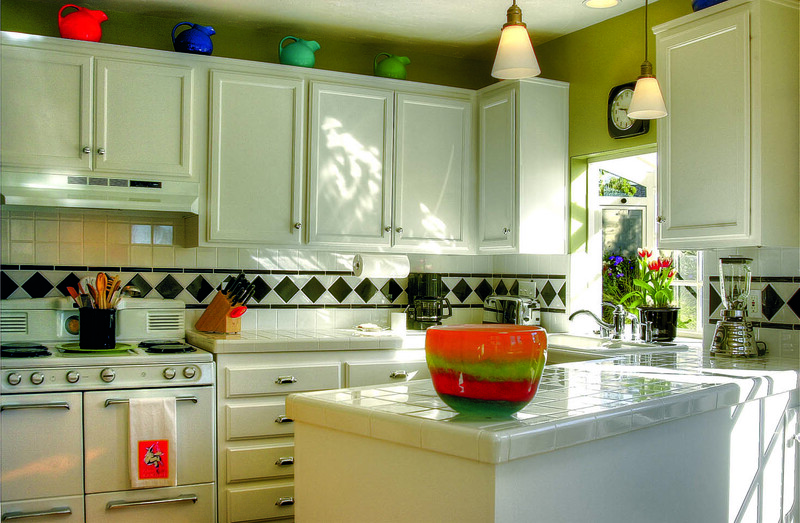 As one of the most heavily used rooms in a house, however, kitchens are the most likely rooms to be updated or even made over. Unfortunately, many bungalows have suffered decade after decade of remuddling: inappropriate flooring and counters, repeatedly painted cabinets and poor light. 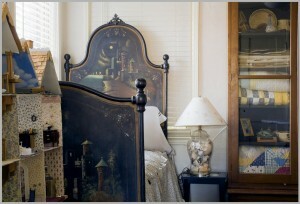 Too often, they feel cramped and cut off from the rest of the house. 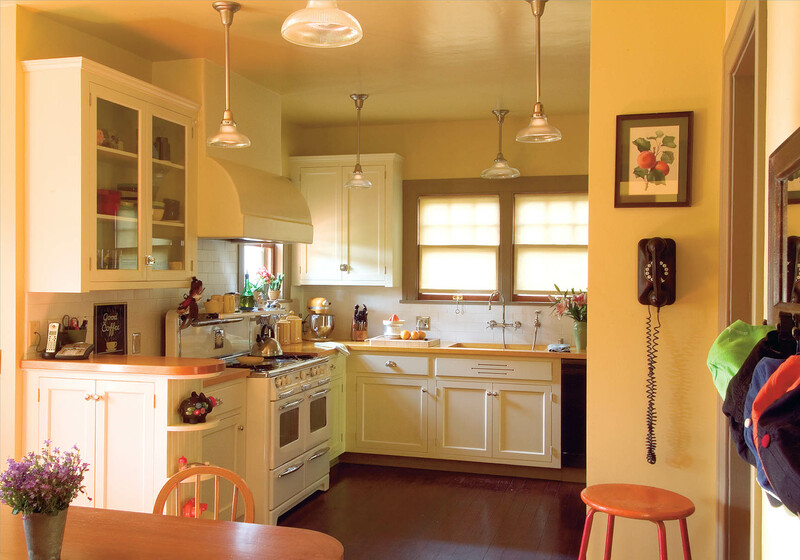 It is worth considering the historic background that influenced bungalow kitchens in determining whether the original compact design fits the spirit of the current occupants. 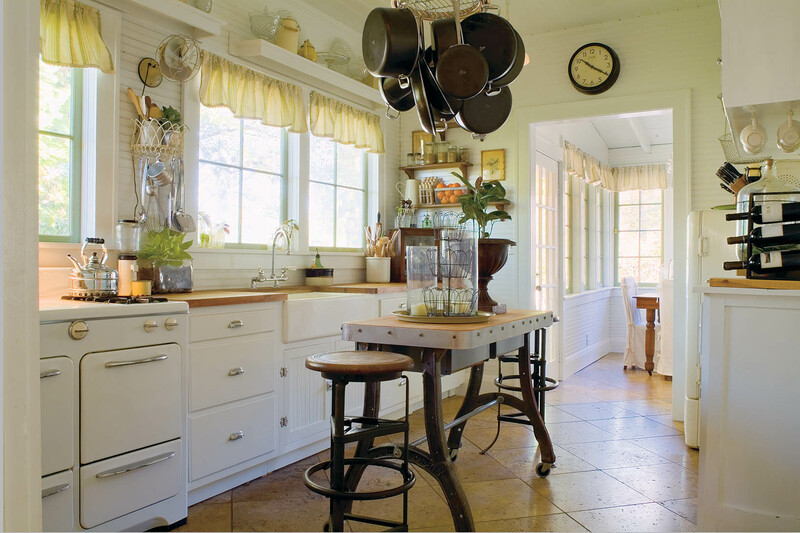 This rich history is very appealing to a particular type of homeowner, one who finds a bungalow kitchen well worth restoring. In this light, the kitchen was a laboratory for the modern woman, and it was a place to work with focus. It was kept separate from the more social rooms of a house, although the bungalow kitchen usually has a small table for work and for intimate meals. It was during this time that the stove transitioned from the house’s symbolic hearth to a utilitarian tool. Also, the kitchen evolved from a fairly “unfitted” room with open shelves and discrete areas for storage into a fitted-out room of cabinets. 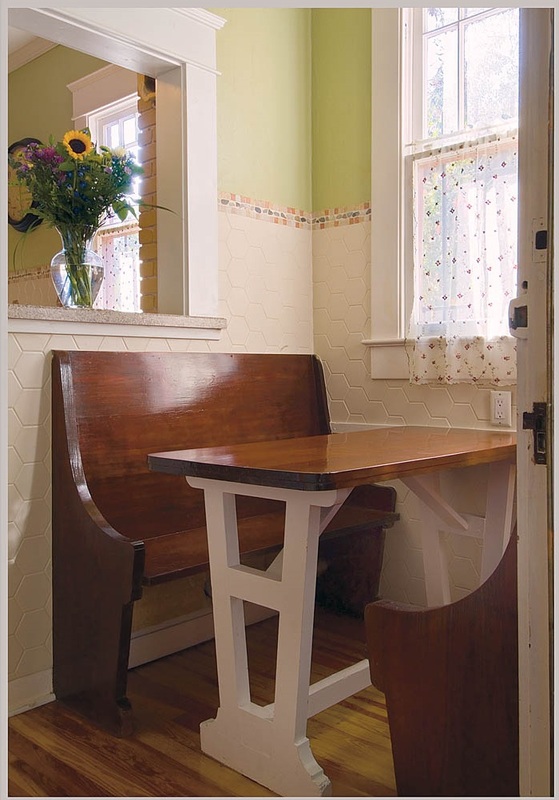 There are options to open up a space other than expanding the footprint. 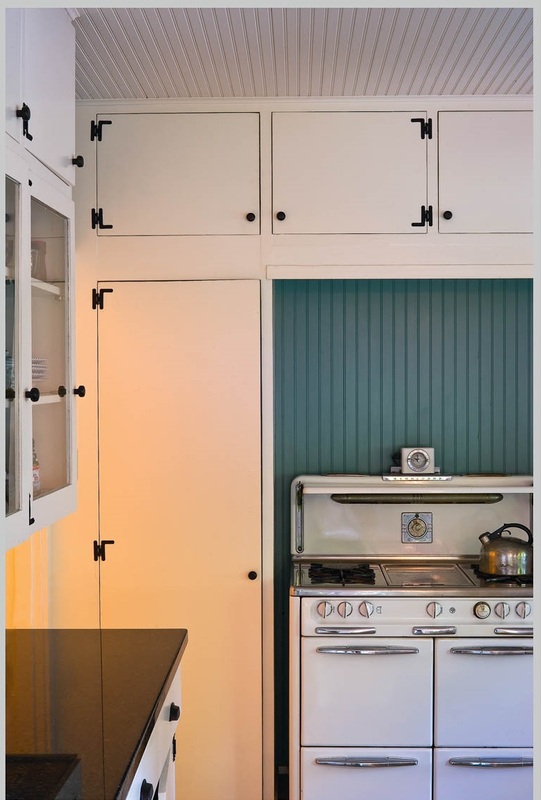 If a particular kitchen’s enclosed feeling does not fit the occupants’ desire for open space, walls can be minimally removed to connect the kitchen to adjacent rooms. Keep as much of the old walls as possible to retain the scale and character of the bungalow. 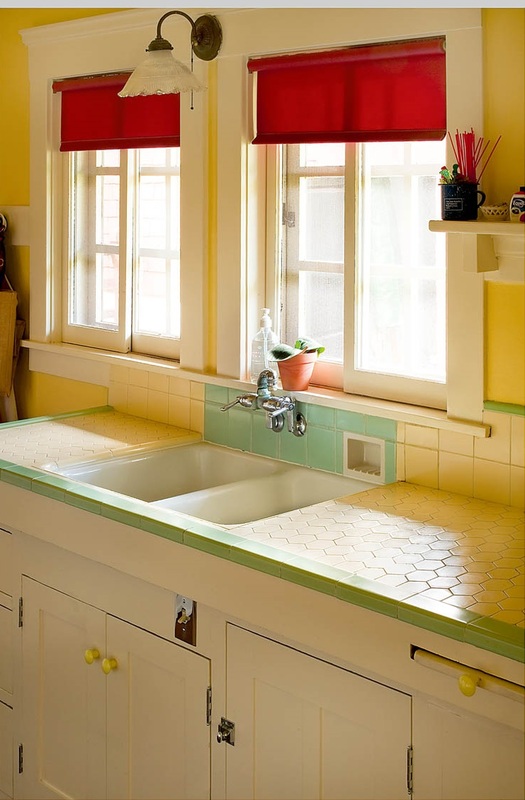 Consider openings, such as a “window” over a sink. 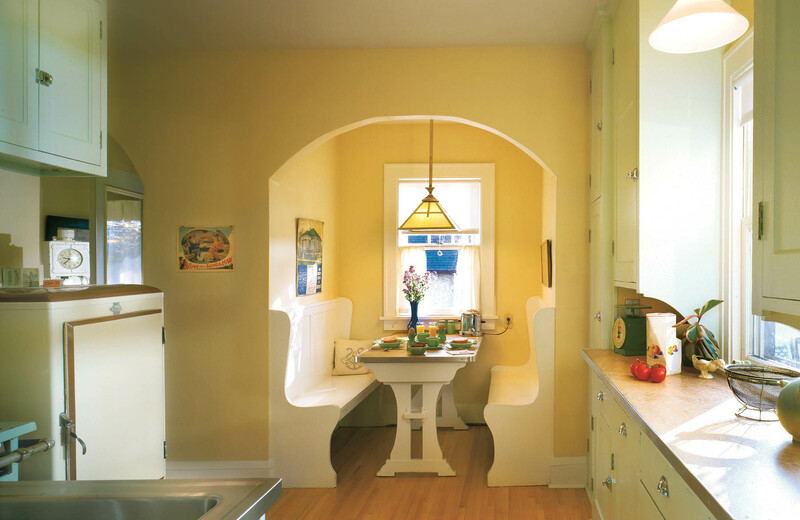 If the kitchen has no table or nook, it is worth considering the addition of an eating area to your plan, even if it means going outside the existing footprint. These are spaces that can be filled with light, both natural and artificial. To maximize light, keep the window sills as low as possible and use warm artificial light. Beadboard or other wood finishes (rather than sheetrock) help tone down sounds and make the space feel cozy. 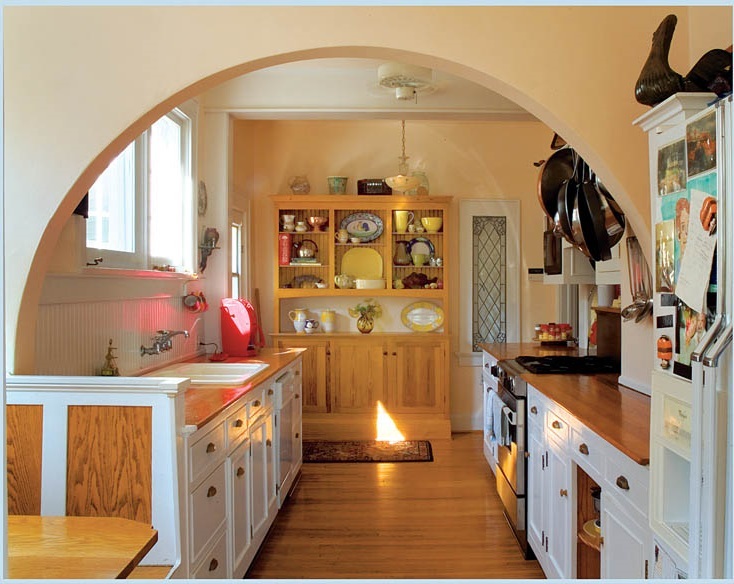 In bungalow kitchens, one rarely finds an island. A central work surface was much more common in large kitchens with domestic help; bungalow kitchens were designed for one person to work in. 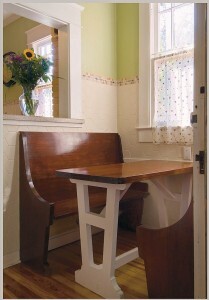 This makes it difficult to retrofit an island into the small space. 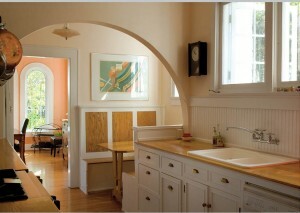 A more practical option is to utilize an opening to another room with a peninsula instead of an island. Sinks can be located under a window or toward an open space inside the house. Many reproduction sinks are available now, from cast-iron freestanding sinks to apron-front ceramic sinks. 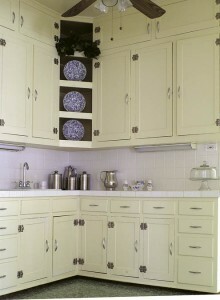 Storage is quite often consolidated in the bungalow kitchen, usually in a sideboard or hutch. Older bungalows had open shelves on most walls of the kitchen, particularly around windows and the sink. 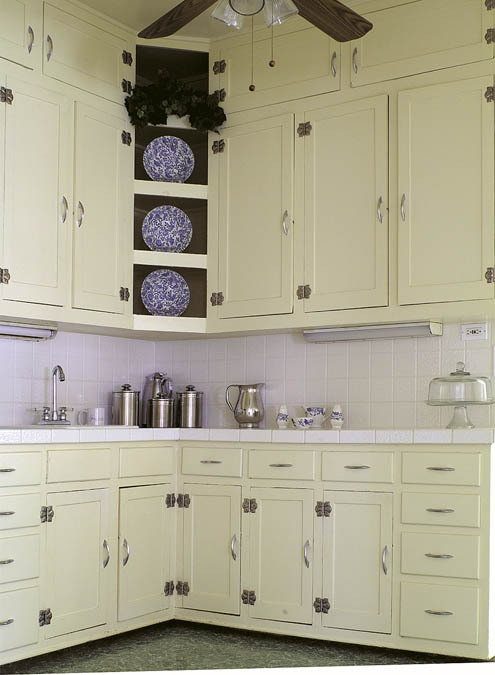 Consider adding heavy-duty storage elsewhere, easily accessible to the kitchen. Even the refrigerator can be located in a pantry if it is nearby. Finishes are particularly important to the character of a bungalow, even if the kitchen has been totally remodeled. 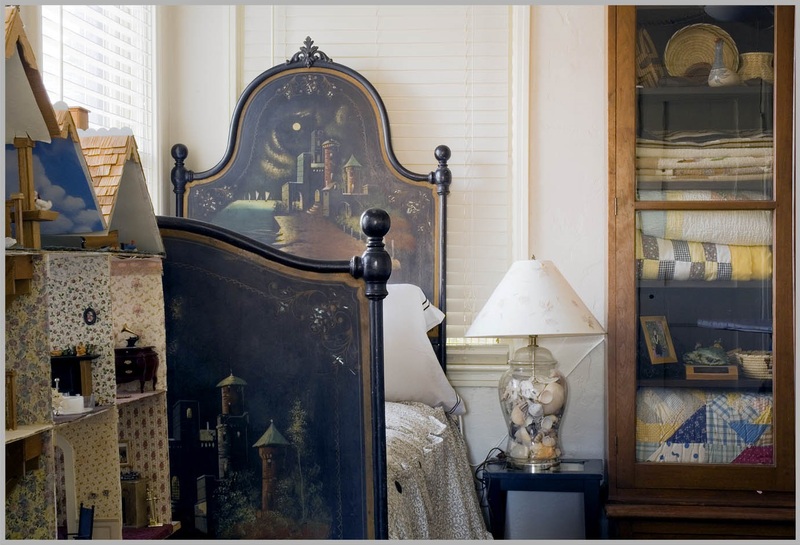 The room should feel bright, clean and cozy, suggesting whites, warm color, and pale hues. 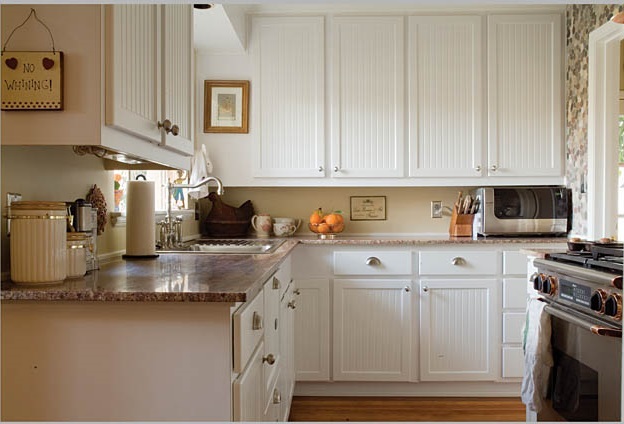 Appropriate countertops could be zinc, copper, soapstone or wood. Granite was not a common material. Floors could be wood or linoleum; tile and stone floors would have been relatively uncommon, although a Victorian woman would have appreciated their washability. Lighting is critically important. 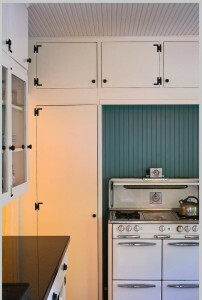 Recessed lighting does not belong in the bungalow kitchen, unless very small (two-inch) cans are used for task lighting. The kitchen will optimally have one or two pendant lights and perhaps some sconces. 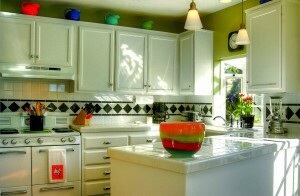 It’s recommended to add halogen, xenon, or LED lights under cabinets to light specific tasks.